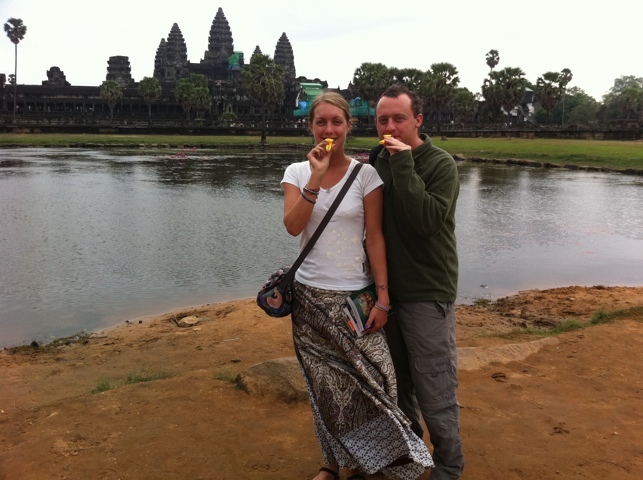 We’d been warned by many that Siem Reap is a bit of a tourist trap. 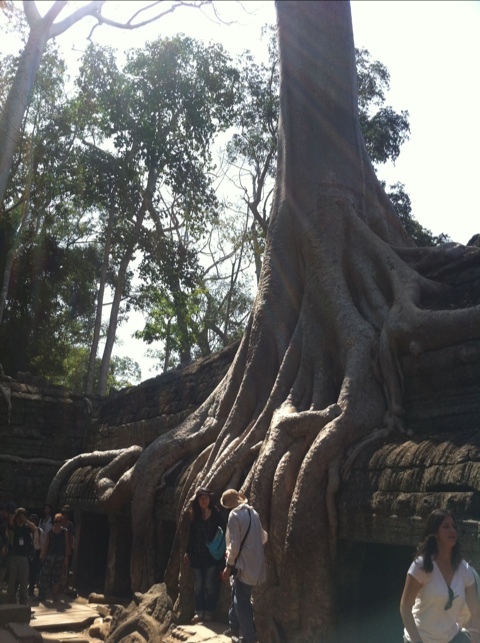 It’s home to the temples of Angkor Wat (and many others), making it a must see on pretty much any itinerary. Fortunately though, the place is pretty spread out, and beyond the confines of the backpacker/bar area around ‘pub street’, we found a nice quiet guest house (‘Sweet Dreams’), and some lovely riverside walks around the town. Being further north, you can immediately appreciate the drop-off in humidity, making the climate pleasantly warm without being sweaty all the time. A lovely relief! As part of the tourist thoroughfare, the town is home to ‘The National Museum of Angkor’, which was the most modern (and most expensive, at $12 each) museum we’ve been to since starting. Housed in a huge complex, it seemed more like a Roman villa, with bright white walls, open courtyards and spiralling staircases – as well as pools of blue water here and there. If it wasn’t for the sunshine in January and the lack of a sulphurous smell, I’d have thought we could have been at a renovated version of the Roman Spa in Bath! 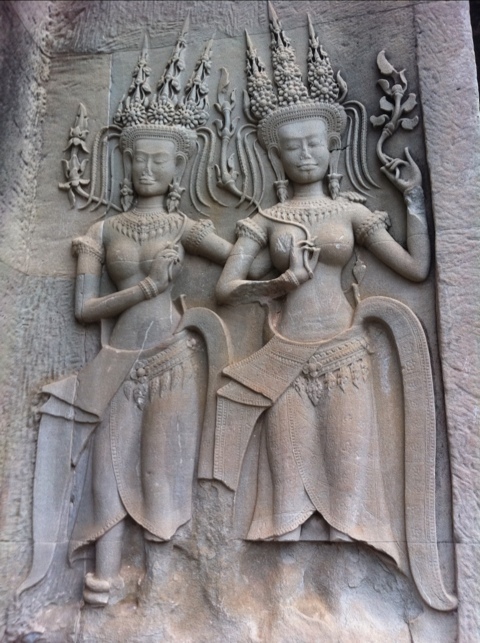 The museum itself gave us the lowdown on the history of the state of Angkor, as well as the religion and symbolism behind the temples themselves. It was fantastically modern – like a new wing of the science museum in London, with multimedia displays and videos alongside rooms full of artefacts bathed in bright spotlights. The only bad thing to say about it is that unlike many of the museums we’ve been to, it was quite clearly for the international tourist – its price alone (even with a substantial reduction for locals) apparently enough to ensure that the very people these temples were built for were absent from their own ‘National Museum’. Or maybe they all went last week instead! 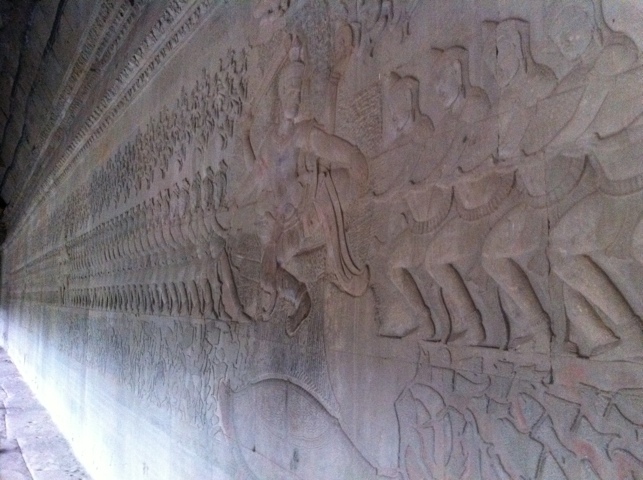 Other than the subject or streams of superlatives, and famous silhouettes, I confess that I didn’t really know what Angkor Wat was until we’d visited. It is by itself the largest religious complex in the world, originally Hindu and now Buddhist, with decorative stone carvings to reflect the change in affections over the years. The place itself is huge – with a 190 metre moat, and is one of a set of temples, former cities and other structures that fill mile after mile of the countryside north of the town. It’s all pretty impressive! Angkor Wat itself is famed for its sunrises, with the red dawn forming directly over the black outline of the central towers of the temple in a perfect photographic moment. And who are we to pass up such an opportunity for luminescent beauty, even if it is at the ungodly hour of 6am? 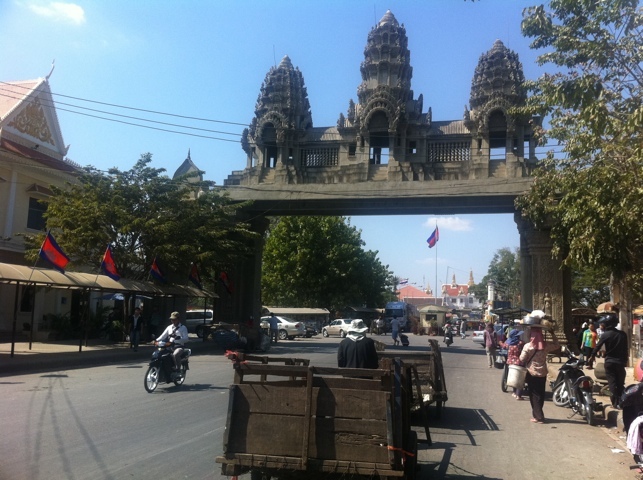 Having booked a rickshaw the previous day to take us round the temples, we rose at 5 ready for our 5:15 pickup. When it hit 5:30 and the driver still hadn’t arrived, we began to get worried. Some of the staff at the guesthouse were up, and we were asked who we were waiting for. I drew a blank. Ben? Ned? Mic? Fortunately, Laura came through with ‘Mab’, although the response wasn’t immediately helpful. “Ah, he went party last night, drink too much, he no drive”. Right! We got up for this?! And this, we discovered, is why the guesthouse gets good reviews – yes, it may be that their receptionist/driver who gladly accepted our booking last night is now still drunk in bed, but they leapt into action to resolve the problem. The manager appeared, with his usual “Hello Simon” greeting (a greeting he used with either of us interchangeably while we were there! 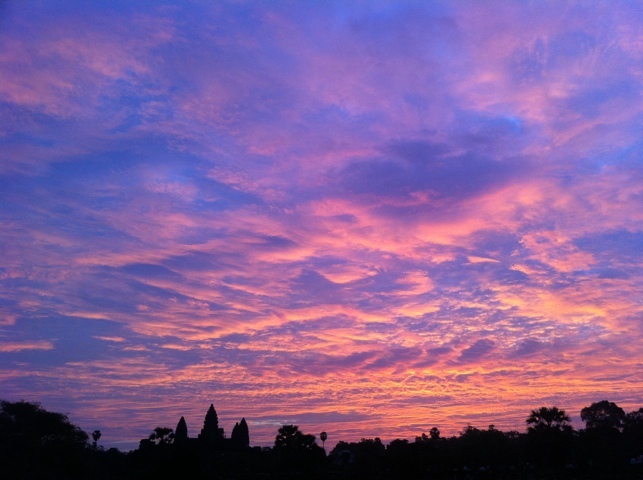 ), and looked slightly panic stricken when we said we were up to see the sunrise over Angkor Wat. The sky was already beginning to get light. Five minutes later, they’d found and woken a replacement, hooked up a cart behind a motorbike, and we were off – and we made it! Hats off to the ‘Sweet Dreams’ guesthouse and, appropriately, sweet dreams to our original driver! We were far from the only people there to witness the pink spectacle of dawn, but it was impressive nonetheless, as the varied shades of pink, blue and yellow filled the expanse of sky above us. 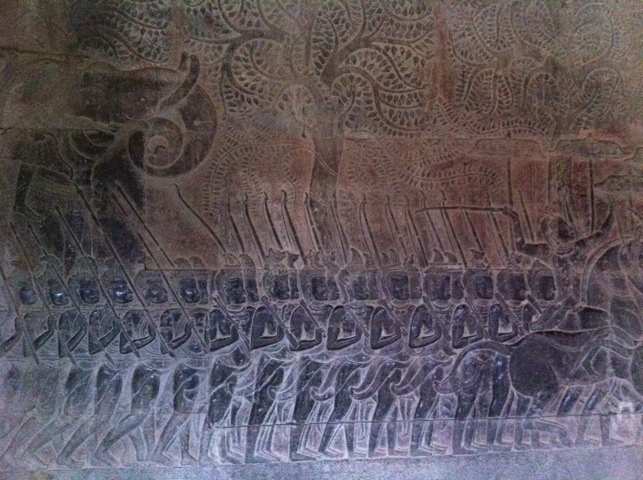 As the light got better, we wandered around the complex and having bought the destined-for-a-future-coffee-table glossy book on Angkor Wat (my parents will be proud, especially since it only cost $5), spent some time admiring the 400m stone carved mural that surrounds the inner temple. We learnt a lot about the Hindu tale of ‘The Churning of the Sea of Milk’, the carving very detailed and understandable with the help of the book. Angkor Thom is a former city, long since abandoned, but once home to some one million people at a time when London numbered only 50,000. 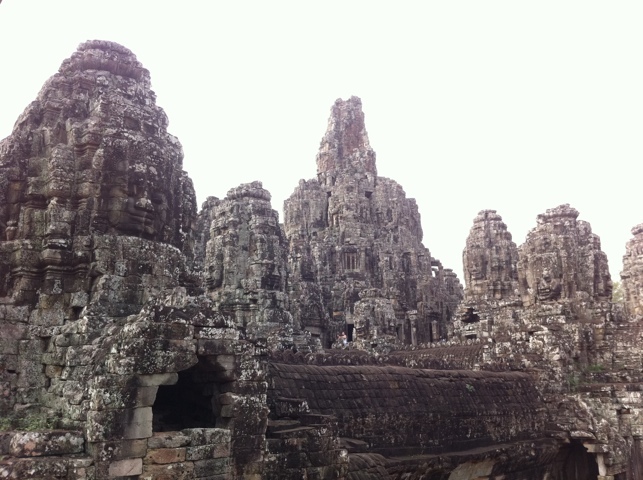 Most memorable was the Bayon, where numerous huge stone faces stare down at you from the pillars forming the temple mound, like Gods with eyes following you as you dive in and out of the maze of passageways below. We managed to find a Geocache on the way round too! By 11am, we were suffering from Temple fatigue (we had been at it for 5 hours by this point! 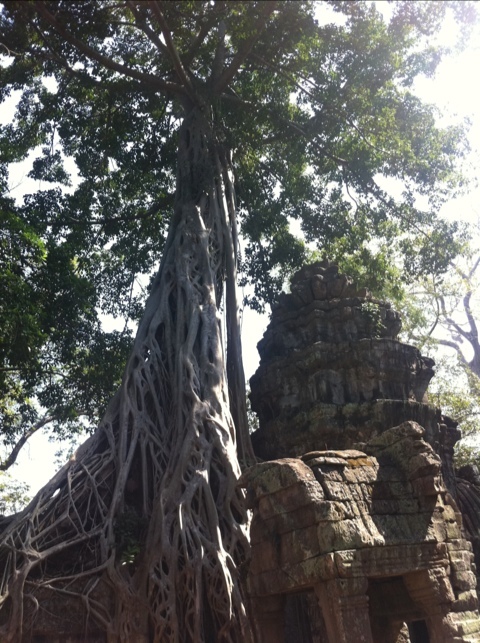 ), and it was with some relief that we made our final stop – Ta Phrom, or as everyone seems to call it, the ‘Tomb Raider Temple’. Like many of these sites, it was overrun by jungle when rediscovered in 20th Century, but a decision was made to stabilise the structure and then keep it in this state for visitors to see a ‘jungle temple’. Perhaps someone knew there was a Lara Croft film waiting to be made? Although we were expecting something altogether more green and overrun, it was a real spectacle with gigantic trees growing in, on, and through the ruins, their huge roots clutching the stone like tentacles from some giant monster from the deep. I think the picture below does it justice. There’s certainly no need for the fiction of Hollywood to make this come alive. For our final day in Cambodia, we went on a cookery class to better appreciate the cuisine and hopefully learn some skills to use back home. Laura’s got the lowdown on the food, but suffice to say it was great, and we were stuffed by the end of it (although fortunately cannibalism is off the menu!). 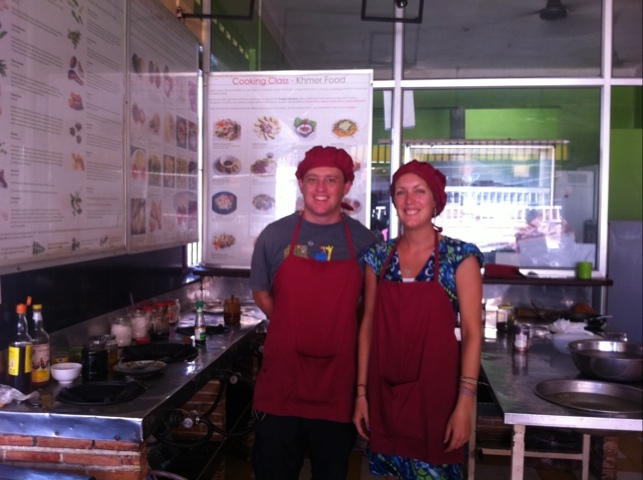 Two chefs trained and ready! We took a long bus journey across the border to Bangkok, which despite being infamous for scams going in the opposite direction, was surprisingly easy, if slightly enduring. There were coloured stickers and even numbers to keep us in order, a long queue to leave Cambodia while everyone was fingerprinted (when leaving the country, which is slightly beyond me), and even some tasty cheddar and salami baguettes thanks to some good planning on our part. It’s strange to be saying goodbye to Cambodia so soon – although we’ve spent a few weeks here, we only really stopped in three different places thanks to Christmas, and it feels like we’ve just scratched the surface. It’s an interesting country on the way up after the horrors of the Khmer Rouge, but one which is still finding its feet in many respects – the lack of economic power is evident by the use of the dollar absolutely everywhere, with even the cash machines doling out american bills; the country ranks pretty poorly in the global corruption indexes and this has got worse in recent years; and the posters asking people to be vigilant to foreign pedophiles really underline how tourism can bring terrible negatives. In spite of this, it’s a place we found hugely warm and welcoming – with promise of plenty more treasures left undiscovered for a future adventure. 1. Buy some Brie to make tasty sandwiches for a long bus journey (if you buy a baguette you can cut costs and make it last for two meals). 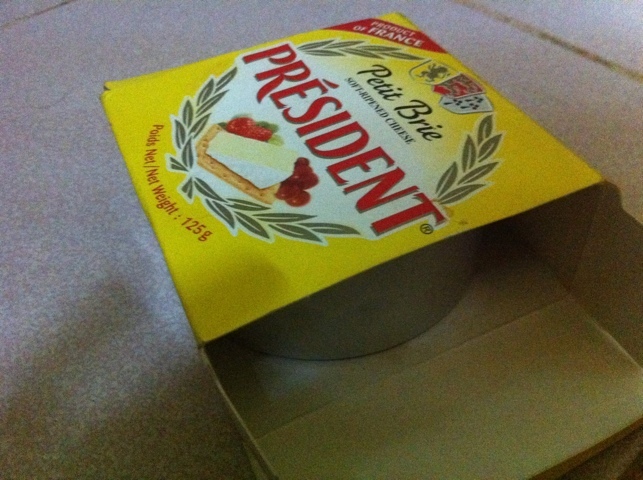 Surprisingly the Brie is packaged in a tin, keep the tin as it may prove useful. 2. 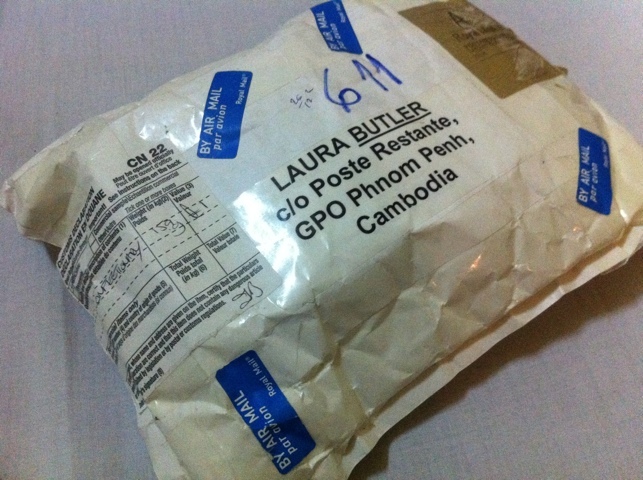 Visit post restante at Phnom Penh post office and collect Christmas goodies sent from home. 3. 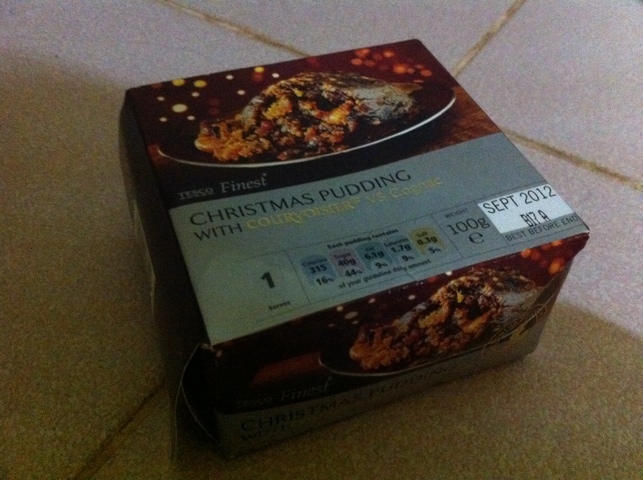 Open up package from parents and delightedly unwrap a Tesco finest Christmas pudding! 4. 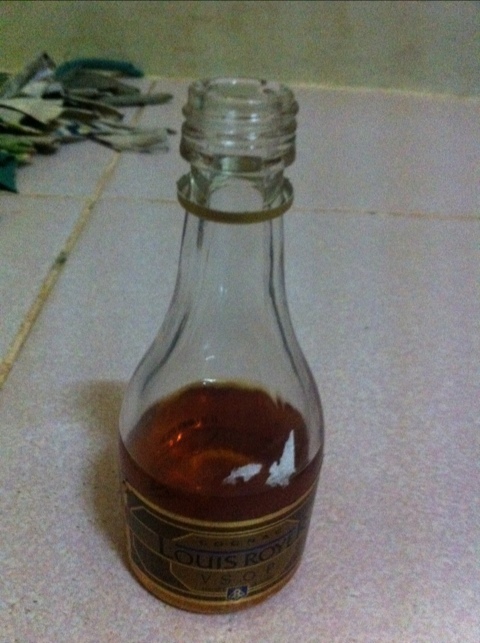 Buy a brandy minature from your local shop (may cost more than you’d expect). 5. Ask your guesthouse for a plate, a spoon and some ice (ice to cool the pineapple palm wine you bought). As an unexpected bonus the guesthouse provides you with a bucket of ice plus tongs. 6. Clear a good space on the tiled guest room floor, making sure all flammable materials are at a safe distance. Then light a tea light. 7. Remove pudding from packaging and place in empty Brie tin. Using tongs hold the tin over the flame. 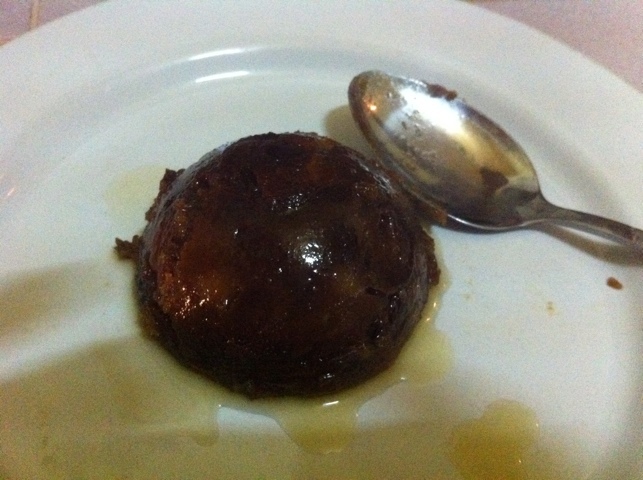 After a few minutes turn pudding to heat the other side. 8. 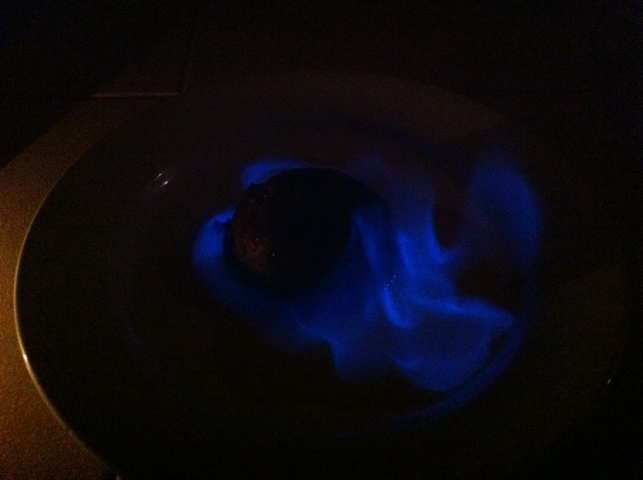 Turn pudding out onto plate and douse with brandy. 9. 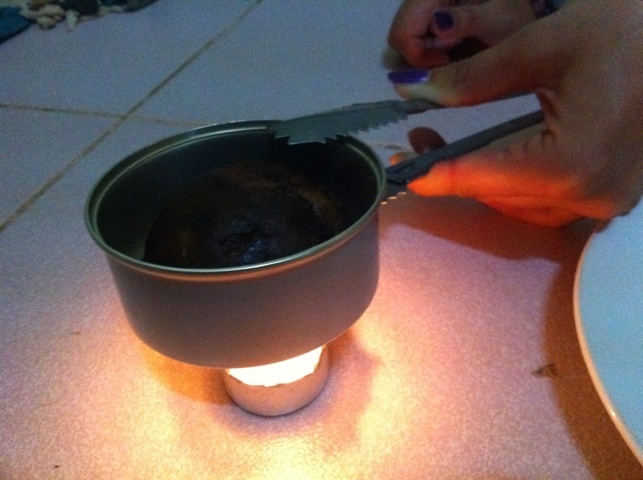 Heat some brandy in the improvised “pan”, pour into metal spoon and set alight. 11. Enjoy the fruits of your labour, remember the proof is in the pudding!